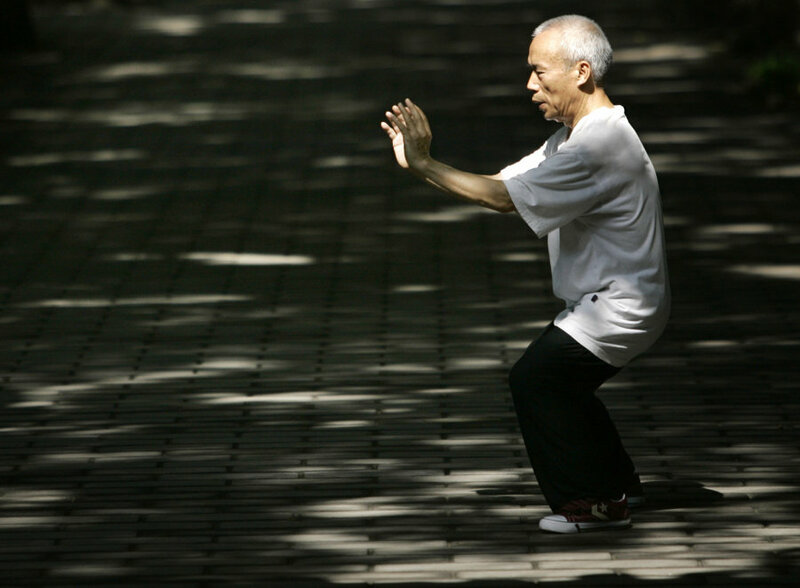 Tai Chi has its roots in ancient Chinese medicine, dating back to around 500 BCE. It is a martial art whose ancestor is qigong. Unlike the quick and aggressive movements of most martial arts, the main features of Tai Chi are slow and graceful movements and regulated breathing, with the combined intention of being a form of self-defense and a technique of enhancing inner calm and equilibrium. Tai Chi experts are able to balance their mental and muscular strength and exert energy more efficiently, with maximum force, in order to inhibit a much more energetic aggressor without tiring or losing control. There are many potential health benefits that have been connected to the practice of Tai Chi, from lengthening life and slowing degenerative conditions associated with aging, to increasing flexibility and endurance, to toughening muscles and lowering stress. Practicing Tai Chi has also been shown to provide another major benefit, especially for older people: improved balance and lower likelihood of falling. Stress itself is known to be a killer, and has been linked to the incidence and escalation of many chronic diseases, such as diabetes, heart disease and cancer. Observing a mindful regiment that includes Tai Chi can positively affect daily life and future health by reducing stress and promoting overall physical and mental well-being. Tai Chi exercises can be practiced alone or in groups. A 2009 study published JAMA showed a link between Tai Chi and lower blood pressure and increased exercise capacity for patients with Cardiovascular Disease (CVD) and those with CVD risk factors, such as diabetes.